Permits are designed for temporary movement of players, not a permanent clearance or transfer and are made available by Sport. Permits must be instigated from the club level of the database (in the same area as Requesting a Clearance). 1. From the club level menu, click on Members and select Request a Clearance/Permit. 2. Note: The 'Request a Clearance/Permit' screen may differ depending on the level of the database you have logged in at and how clearances/permits are configured by the National Body. Use the most suitable method to search for the player and click on Select. Below is an explanation of the Permit request process for each of the four methods described above. Skip straight to the method that you wish to use. 1. From the 'Select a Source State' drop down list on the 'Request a Clearance/Permit' screen, select the source state that the player currently belongs to. 3. 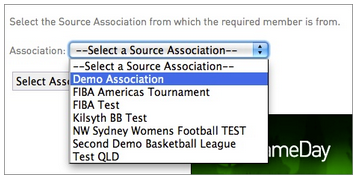 The next step asks you to select the source association that the player currently belongs to. 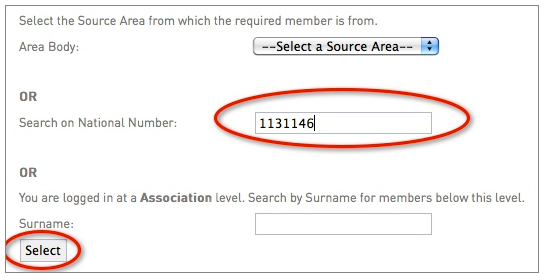 Click on the Select a Source Association drop-down list and select the association. 4. Click on Select Association. 5. The next step asks you to select the source club that the player currently belongs to. Click on the Select a Source Club drop down list and select the club. 6. Click on Select Club. 7. The next step is the final step in the player search process. 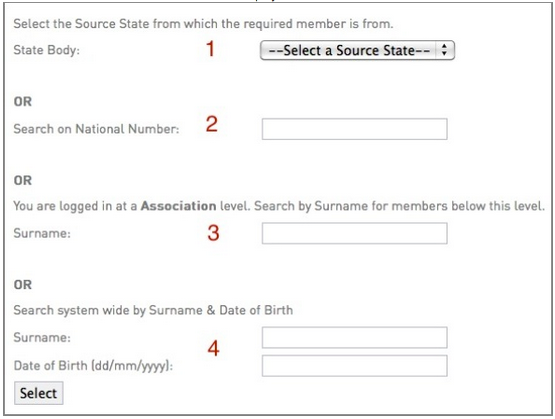 Enter the player's national ID number, and/or their surname, and/or their date of birth. 8. Click on Select Member. 9. A list of matching members will appear to select from. Click on select to choose the player you want to process the clearance for. 10. The player's details will appear at the top half of the screen. You will have the option to either Request a Clearance or a Permit. To request a Permit, fill in all the required details and scroll down to the bottom of the page to select the Permit Type. The tribunal history shows the player's disciplinary record and indicates whether the player is currently serving a suspension. The 'Reason for Clearance/Permit' field is an optional field by default, but your National Body has the option to make it a compulsory requirement. You can also enter any additional information relating to the Permit request. 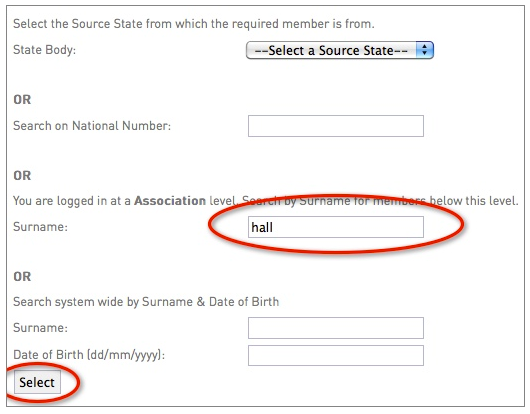 Select the Permit Type (explanation of each is listed below) and enter the Date Permit From / To fields. 1. Match Day: Allows for a permit at short notice to another club for a short period of time without requiring their online approval. 2. Local Interchange: Allows permitted player to play for both clubs for the duration of the permit (requires online approval). 3. Temporary Transfer: Allows a permit to another club for an agreed period of time (requires online approval). Click on Submit Permit to initiate the Permit Request. This will trigger an email to the source association and club, notifying them of the Permit request. 11. A confirmation message should appear to indicate that the clearance request has been successfully submitted. 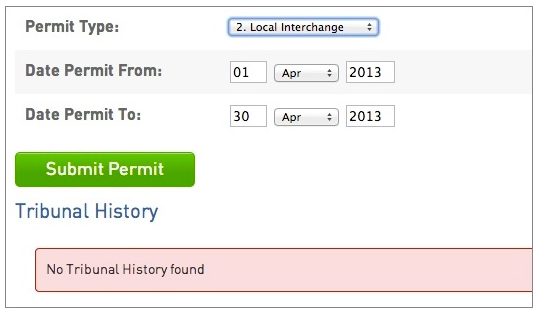 Click on Return to Clearances/Permits to return to the Clearances/Permits List. 12. The Permit will appear on the Clearances List with the status 'Pending'. For more information about the Clearances List, click here. 1. 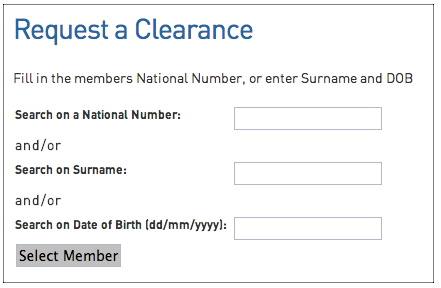 From the 'Request a Clearance/Permit' screen, enter the player's National ID Number in the 'Search on National Number' field. 3. The member's record will appear. Click on select next to the record you want to process the Permit for. 4. Continue to follow the Permit request process as per steps 10 - 12 under 'Search for player by source state' above. 1. 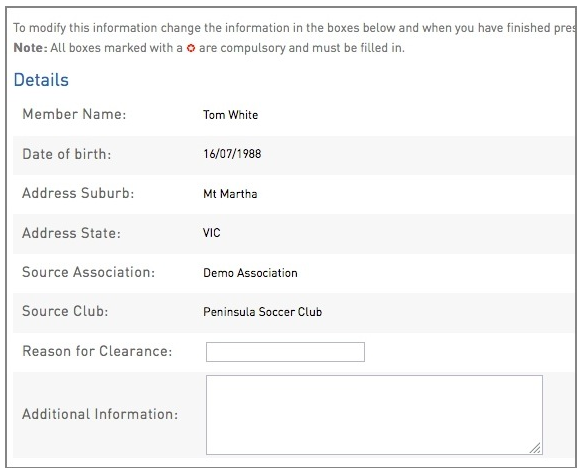 From the 'Request a Clearance/Permit' screen, enter the player's surname in the 'Surname' field. 3. A list of matching members will appear to select from. Click on select to choose the player you want to process the Permit for. 1. 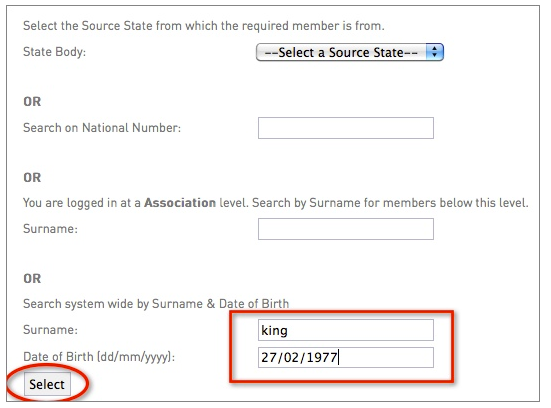 From the 'Request a Clearance/Permit' screen, enter the player's surname in the 'Surname' field and date of birth in the 'Date of Birth' field. Take note of the required format for the date of birth. NOTE: if a player is already involved in a pending clearance or permit, then the Permit will not be able to be submitted. The following message will appear. 1. Click on Members in the menu and select List Online Clearances/Permits. 2. From the Clearances/Permits List, click on the Edit button next to the permit request that you want to view. 3. The Clearance/Permit Summary for the player will open. Scroll down to 'Clearance/Permit Approval Details'. This shows each body involved in the permit process and the body the permit is currently awaiting approval from. In the below example, the permit has been approved by the source club (Australian National Sports Club), and is awaiting approval from the association (Demo Association).